Hello! 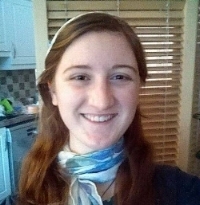 In case you don’t know me already, my name is Abigail Watson and I’m an intern with Alpha Ireland this year. As part of my ‘work’ with Alpha (if you can call it that! ), I had the amazing privilege of going to a youth leadership conference called Momentum recently, and I just wanted to tell you about it and how it has encouraged me. The tag-line for the weekend was ‘Encourage. Equip. Excite.’, which sums up the whole thing pretty well, I think. It was a weekend for anyone interested in or already involved in youth work, from those who have never done youth work in their lives to those who do youth ministry as their full-time job! Obviously, I can’t speak for everyone who came, but personally, I found that it more than achieved the promise in the tag-line, as I definitely came away feeling encouraged, equipped and excited. I was also moved, challenged, and very inspired! It was a very powerful weekend in numerous ways, and hopefully will be the first of many more in the years ahead. Gathered together for a quiz! One of the most encouraging aspects of the weekend for me was how honest, open and vulnerable many of the speakers were about the challenges of youth ministry. I was particularly struck by Peter Rigney, the National Director of Alpha Ireland, who shared about how difficult things were for him when he first began working with Alpha. It was especially encouraging for me to hear that he often dreads having to do talks like those he was doing at Momentum, as I often get very nervous when asked to do anything from the front! I am not one of those people who loves public speaking and enjoys giving talks to large groups of people, so it was great to see how Peter has been able to do so much as National Director, despite the challenges he faced in this area. Other speakers were just as open too, and made sure that no-one tried to put them on a pedestal: they made it really clear that what they do and have done is through God’s grace and not by their own strength. They could have told us all about their success stories, made it seem as if they did everything perfectly, and left us feeling overwhelmed, but they did the opposite – as Theresa Cronin (the Alpha Youth Cork Coordinator) commented, it was ‘sharing the good, the bad, and the ugly’. So basically, I left feeling really positive about youth work in general and feeling that I really can contribute something worthwhile, even if I’m not the super-confident, charismatic type! Peter Rigney talking at Momentum. Momentum was also a great weekend for being equipped in a practical way: finding out about useful games and resources/materials that are available for youth ministry. For example, we heard from Tearfund about their resources for looking at global justice issues with young people, from Annette Evans about prayer spaces, from Youth for Christ about how they use soccer as a fun way to engage with teenagers, from Jonny Somerville about the Nua Film Series, and from several others too! I realised that there are lots of resources available once you know where to look – much more than I had thought! Anthony Clarke sharing about his work with youth! 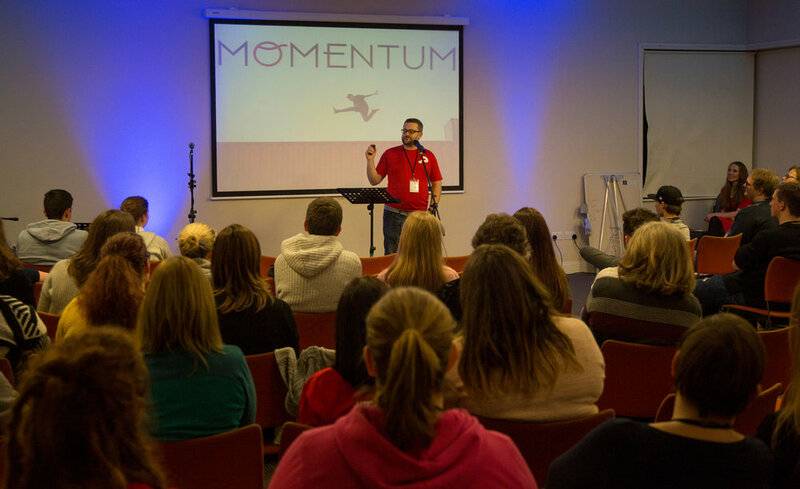 Finally, I think that Momentum really did manage to excite those who came about youth ministry (even more than they were already, that is) - most people seemed to leave feeling inspired and all fired up! For me, the most exciting aspect of Momentum was probably the sense of shared community and unity across the denominations and seeing how everyone there was so passionate about youth ministry. Sometimes it’s easy to think that there’s barely anyone doing youth work in Ireland, and youth workers can feel isolated, but this was 130 of us (including those running the weekend) all coming together and realising that we can support each other and work as one big team. One participant, Aidan Duggan, commented on how the weekend has given him a great sense of ‘hope and purpose’ and also on the potential of the event: ‘I’ve a feeling a lot is going to come out of this.’ I really think that he’s right – it’s the first of its kind, and really brought people together from different denominations, as well as different places. It’s not often that you get to go to an event that is so ecumenical, both in terms of who was running it and those who attended, and this was very fitting as it was coming up to the week of prayer for Christian unity (which is this week). It was also exciting to dream big and think about how we can step out of our comfort zones and allow God to work through us. Peter shared a great quote from Mark Batterson with us on this: ‘Go after a dream that is destined to fail without divine intervention’. I know it might seem wiser to have dreams that are achievable and reasonably realistic, but let’s be ambitious with our dreams and trust the promise that ‘all things are possible with God’ (Matthew 19:26)!